Content Objective: I will be able to create an argument to support a claim by reading the sample persuasive speech and completing the Actively Learn comprehension questions. Language Objective: I will use the given outline to organize my persuasive speech. ​Homework: Outline is due 2/18. Do Now: Quickwrite - What do you think is the most important element in a persuasive argument and why? 1. You will be reading a student's persuasive speech on Actively Learn. 2. As you read, examine how the speaker organizes their argument. 3. You must share at least one comment on Actively Learn with the class about what the speech makes you think about or feel. 4. You may work with a partner. 5. Click here to go to Actively Learn. 3. 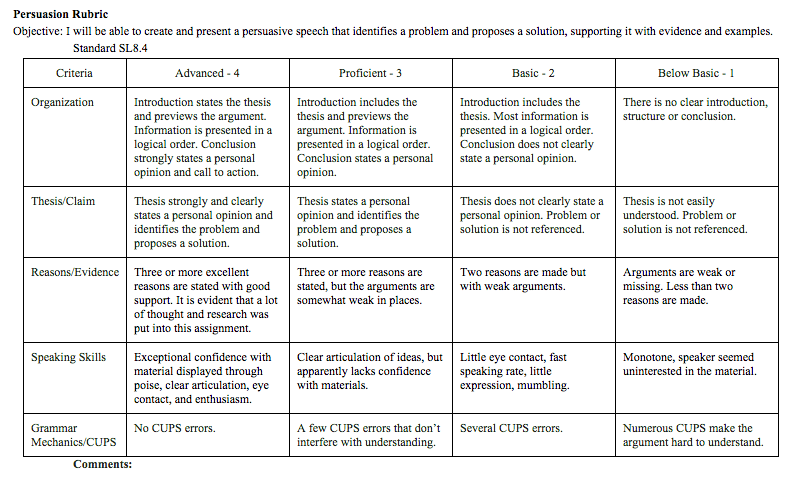 Click here to see a list of possible topics for your persuasive speech. You need to have a topic picked before the end of class.